Replacing your windows is a major home improvement project, but it doesn’t have to be difficult. Our replacement process makes for quick and easy windows installation in St. Charles, MO. Renewal by Andersen® of St. Louis has a team of installation and design experts with years of experience implementing this process in communities in and around St. Louis. Pre-Installation Measurements – Our window expert will evaluate the condition of your windows and window frames and determine the best installation method for your home. We will also measure your window openings precisely, making sure that our custom-manufactured windows are a perfect fit. Arrival – Our window installation crew will arrive on time and ready to install your new St. Charles, Missouri, energy efficient windows. We’ll make sure to bring everything we need to install your windows, including equipment to protect your home and vacuums to clean it after the installation. Protecting Your Home – We’ll be sure to treat you and your property with respect. We’ll carefully remove valuables and furniture away from the window installation area. Our crew will also have protective footwear to make sure that we don’t bring mud or dirt into your home. We will also lay down mats, drop cloths, and runners. Removing Your Old Windows and Installing Your New Windows – Our crew will skillfully remove your old windows while avoiding dust and debris buildup in the work area. They will also realign and readjust the levels in your window’s open area to make sure that our windows fit properly. They will also test your window’s operation and functions. Weatherproofing and Finishing Touches – Our expert installers will fill the small gap between your new windows and house frame with special insulation. This will eliminate drafts and ensure that they are airtight, energy efficient, and weatherproof. They will then cover the foam with a trim to accentuate your interior. Final Cleanup – The crew will then remove the protective film surrounding the window and shine the glass area. We will thoroughly clean the work area and return your furniture to their proper positions. We can install the full range of popular window styles, including double hung, specialty, bay, bow sliding, picture, and casement windows in St. Charles, MO. We h andle the entire window replacement process including sales, manufacturing, installation, and after-sales service. Since you’ll be dealing with a single company, the process will be simple, straightforward, and convenient. 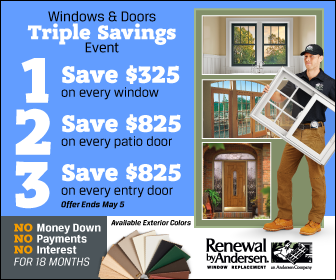 Call us at (314) 332-2364 to learn more about our window replacement process. You can also ask for a free estimate.